Sangha Jungle lies at the heart of an extensive tropical wilderness. The isolated location holds a variety of unusual creatures from an older era, as well as modern interlopers. A swamp, the Sucking Mire, stretches across the northwest portion of the region, making travel a slow and hazardous process. Southeast of the Mire, the ruin of the Shrine of Flowing Flame stands atop a lonely hill and offers visitors a view of the smoking peak of Ratnak, an active volcano. Who or what destroyed the shrine remains a mystery. Beyond Ratnak lies the Burned Land, a scorched waste of lava flows, blackened and dead trees, and soot-stained rock. 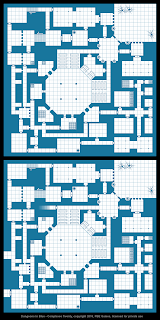 Complexes #16 shows a traditional dungeon with many large pillar-lined rooms. An outdoor altar graces the dungeon entrance. Complexes #17 is a network of large caverns surrounding an underground lake. 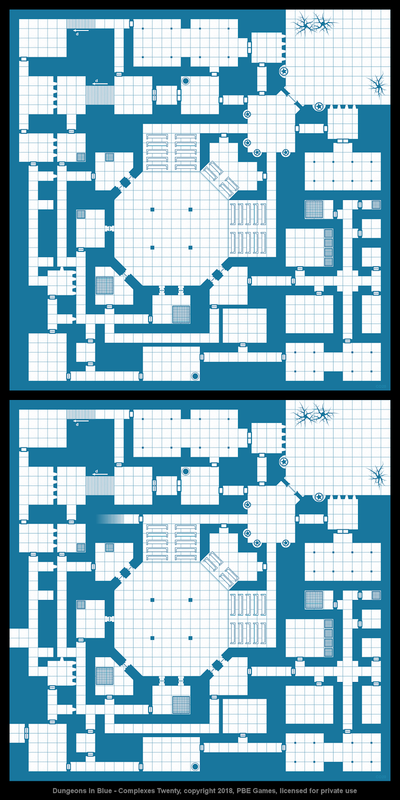 Complexes #18 shows a traditional dungeon complex with a large throne room and many narrow side corridors. Complexes #19 depicts a lava-filled cave with many crystalline growths and steamy geysers. Complexes #20 shows an underground arena surrounded by bleachers and a network of cage-filled rooms for beasts or gladiators. Complexes #21 depicts a network of oddly regular, circular caves. Some contain pools of water; others hold strange objects. Complexes Triple Pack #6 contains Complexes #16, #17 and #18. Complexes Triple Pack #7 contains Complexes #19, #20 and #21. 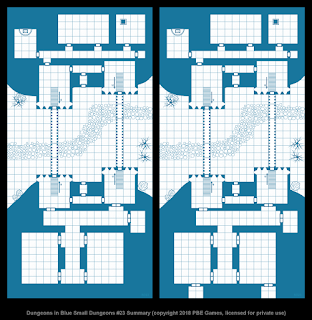 Dungeons in Blue - Small Dungeons #22 depicts a simple cave complex with a few hidden secrets. Dungeons in Blue - Small Dungeons #24 is an underground complex with several large interconnected chambers adorned with statues and strange objects. Small Dungeons Map Pack #8 contains Small Dungeons #22, #23 and #24. Finally, I've published a few one-off add-ons for Dungeons in Blue. Floor Grid is a single image of the floor pattern I use for all geomorphs. Dungeon builders can use it to cover unwanted features or carve out new rooms in existing tiles. Rock Formations contains close to 400 boulders, stones, crystals, and stalagmites plus a number of rock clusters and rough stone walls, all laid out in a single PNG image with a transparent background. 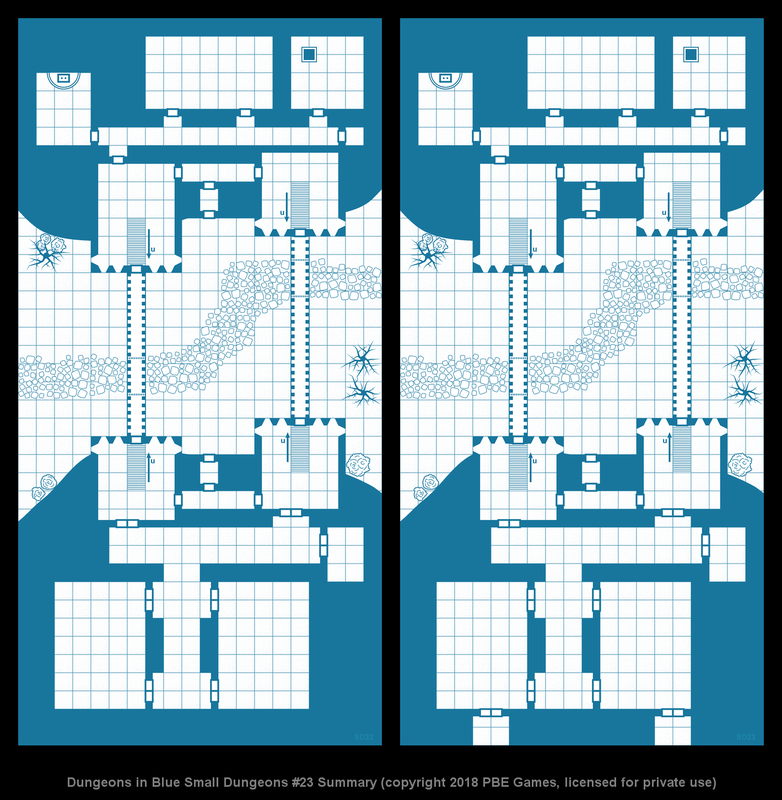 Customize your Dungeons in Blue creations by cutting and pasting individual components into your geomorphic maps. Note that a handful of boulders and stalagmites from this set have appeared in previous Dungeons in Blue releases (notably Icon Packs One and Two), but there are still over 350 unique items in this product. That's it for now. As always, thanks for reading and happy gaming! Note: all comments are moderated to block spammers. Please be polite.